Behind the scenes of the many successful projects that Artemis runs there is a managing team like in any other corporation. While the ethos of Artemis is reflected within our corporate governance activities, the details of how the corporation legally works are important to understand. Artemis One Health Research Foundation (CoC: 32172291) was established on the 11th of May 2010. To realize the objectives of the foundation, the foundation is allowed to outsource work to third parties including Artemis BioSupport. The private company (CoC: 51502259) was established on 21st of December 2010 for performing research for the foundation and provide service to the pharmaceutical industry. The results of the private company provide no pecuniary reward (non-profit organization) and 100% is put back into the foundation. The foundation is the only shareholder of the private company. 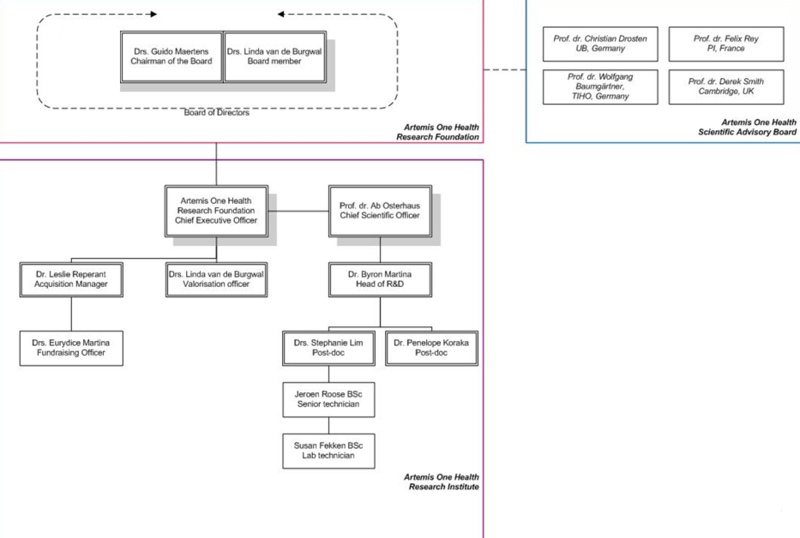 Our organization chart shows the separation between the foundation and the private company. The organizational governance is done soley by the board of directors and the board is supported by the scientific advisory board [SAB] for the technical governance. The Board sets corporate policy, appoints officers, and delegates policy or execution to those officers. The Foundation is governed by a Board of Directors consisting of 3 persons: Byron Martina, Ruud van Hofwegen, and Jeroen Roose. The board of directors of the private company is carried out by the foundation as a legal entity. Through the work of the Board and its Committees, the Board sets policies and strategic direction for the Foundation, approves grant-making areas, fundraising strategies and investments. The board elects a Chairman, which is the Director (CEO) & Chief Scientific Officer, and appoints a usual slate of executive officers. Officer positions are all paid, and serve at the direction of the board in their specific areas of responsibility. Officers are responsible both for managing the foundation and company affairs in their specific areas, as well as reporting monthly back to the board. The board may appoint other officers for corporate-wide functions – this includes Conference Planning, Legal Affairs, Marketing and Publicity, among others. The board delegates the authority to set and execute corporate policy within the officer’s specific area of responsibility. The chief operational officer is in charge of the infrastructure and hardware that keeps Artemis running. Since our infrastructure (websites, mailing lists, source code control, database, ordering, etc.) is a shared resource for all projects at Artemis, it is managed centrally. PMC is in charge of writing grants and managing the running projects. Grant writing and project management are conducted in collaboration with PIKADO B.V, PROMAFUN and FFUND. External funding is the primary source of money for various projects and programs. This funding allows Artemis to carry out its objectives more adequately and to expand and enhance the variety of opportunities available in Artemis. The policies executed by Artemis should establish responsibility and accountability during the grant program. Grants for approved research and sponsored projects are the fiscal responsibility of Artemis and are awarded to Artemis. Artemis holds the project director and principal investigator individually responsible for the proper management of the grant and for meeting the objectives of the grant. Artemis will ultimately be held responsible for the overall administration of funded projects. Therefore, all funds related to grants, regardless of source, shall be administered as research funds in accordance with Dutch law, European policies and Artemis policies and procedures. Integrity is the backbone of good research practice and is an essential prerequisite for maintaining the high standards and credibility. As an organization dedicated to biomedical research in the public interest, Artemis demands that its scientists conduct research in accordance with the highest scientific and ethical standards. The scientists of Artemis pledged themselves to integrity, responsibility, and accountability. An ANBI does not pay inheritance tax or gift tax for inheritances and donations that the institution uses for public interest. If an ANBI makes donations for public interest, then the recipient does not need to pay gift tax. An ANBI is eligible for energy tax refund. Volunteers working for an ANBI are therewith providing a donation under particular conditions. Donors of an ANBI are allowed to deduct their donations from the income tax or corporate tax. We are living in a rapidly changing world with an increased frequency of emerging viral infections in animals and humans. More attention needs to be given to understanding the drivers of emergence of infectious diseases, which may allow the transition to a more sustainable society. It is this daunting task that lies at the foundation of our strategy and thus for the future course of Artemis. The goals of the Strategic Plan will be realized step-by-step by identifying priority areas for each year of the Plan. In the future, we will continue to build on our strengths in scientific excellence to improve the health and wellbeing of society and to boost innovation and economic growth. Our strong commitment to supporting high quality fundamental discovery research will remain at the heart of our strategy. Over the next five years Artemis aims to support excellent discovery science across the fields of virology, immunology to virus infections, vaccinology, and nanomedicine and strengthen partnerships to accelerate the pace of improvements in health and wealth. Picking research that delivers: setting research priorities, which are most likely to deliver improved health outcomes. Research to people: bringing the benefits of excellent research to all sections of society, rich and poor. Supporting scientists: sustaining a robust and flourishing environment for world-class researchers. Our strategy is to support excellent research in areas that pose an enormous challenge to the health of individuals and animals in the Netherlands and the world. While focusing on problems with significant impact, we also support excellent science in areas that would be otherwise neglected or under-funded. In essence, Artemis supports viro-immunological research across the whole spectrum from basic science to clinical studies.